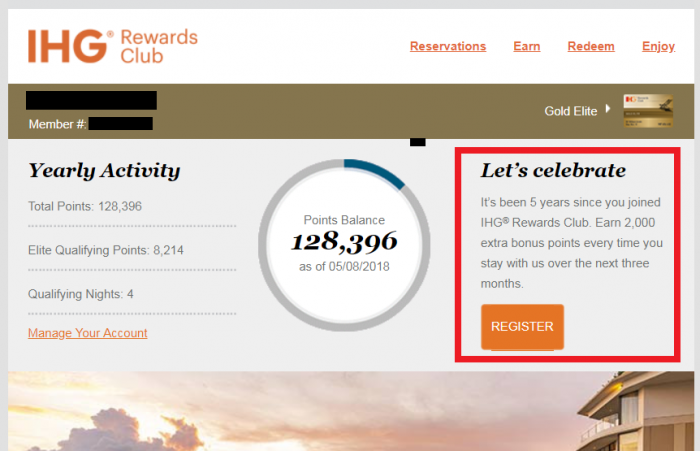 Whine Wednesday: IHG Rewards Club Strikes Again – Sends Out Promo Email & Cannot Register! This week the Whine Wednesday comes from a reader’s case with IHG Rewards Club that is almost like a deja vu what we have covered earlier. A reader received the marketing email above where he was promised 2,000 bonus points for each stay for the next three months to celebrate fifth anniversary with the program. Only problem was that he couldn’t register for the offer. Please see attached for my member number & also the promotion which was just sent to me. I cannot register for this promotion after i click the button from my email. Then what is the purpose of that if i am not targeted member? I hope you’re doing well. It’s great to hear from you-—we’re always glad to assist a valued Gold Elite member like you! I’m sorry for the trouble this has caused you. Regarding your inquiry, I looked up the promotion and looks like you’re correct, you’re not targeted for the ‘Anniversary Bonus 2000 Points 5 years’ promotion. I understand that this is not the response you were hoping for and apologize for any disappointment caused. All of IHG’s members who are celebrating 5 years or 10 years anniversary with the program will automatically receive this email as it is a system generated email triggered to be sent out based on the years you’ve been with us, although not all of our members will qualify for the offer as it has guidelines and qualifications as well. I’m glad you contacted us about your concern. If there’s anything else I can assist you with, please let me know. Another reply from IHG Rewards Club “customer service” that makes no sense at all, although I don’t blame this poor Sara in Manila that needs to copy/paste these replies (how many times have we seen the third paragraph?). Shouldn’t the correct reply had been that sorry for the inconvenience with the promotion but we have now manually signed you up for it without all the other non-sense. Why it is customer’s fault if IHG cannot get their IT and CRM properly function? I am surprised that heads haven’t rolled at IHG’s marketing department when it comes to these marketing and customer “service” initiatives that turn to disasters. Reader Question: IHG Rewards Club Claims To Have Sent Promo Email In An Error & Refuses To Credit Full Points?